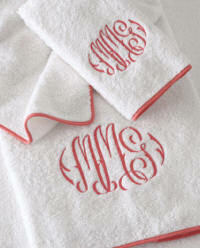 Our Signature Monogram Bath Towel Sets are available in affordable sets with your selection of embroidery color and style. This is a great gift for all occasions (these do not arrive gift-boxed)! Price below includes the monogram as listed below. Terry: Cotton Loop Terry. Dobby border may vary. Monogram Style : Choose your monogram selections below. Monogram Color: View Embroidery colors below and type in your color selection.